Trips and slips are a common cause of injury. Sometimes these injuries can be serious. They can occur at work, at someone else’s premises such as in a shop, or on the street. Bolt Burdon Kemp’s specialist accident compensation solicitors can help you recover damages to get you back on your feet again. 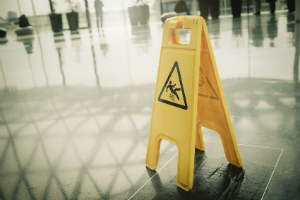 We deal with all sorts of personal injury compensation claims from trips, slips and falls. You may have tripped over a paving stone, or fallen from scaffolding at work. Even if you are partly to blame, you may still have a case. Often it is the third step that is the most difficult to prove. That’s why you need an experienced and specialised personal injury solicitor. Experience does count. If your accident injury claim is successful, you will be entitled to compensation. You will receive compensation for the actual injury itself and your pain and suffering and for the things that you cannot do as a result of your injury (known as loss of amenity), which can include things like hobbies. The amount of compensation that you are entitled to for this aspect of your claim will depended on the nature and extent of the injuries suffered for example how serious the injuries are and how long the symptoms last for. This part of the claim is assessed with the assistance of an expert medical report(s). We will arrange your medical examination with the best medico legal experts in the field which could include for example an orthopaedic surgeon, spinal, surgeon, neurologist, psychiatrist, plastic surgeon. In assessing this aspect of your claim, our specialist personal injury solicitors will consult guidelines called the Judicial Studies Board Guidelines which give brackets in respect of particular personal injuries – for example for a broken leg, depending on severity, around £12,500. In addition we will thoroughly research case law to find cases where claimants have suffered similar injuries to you and use our extensive knowledge, experience and judgement to assess the value of this aspect of your claim. You will also receive compensation for your financial losses and expenses – both past and future. Your financial losses are assessed according to the evidence that we obtain to show what you have lost. This can include loss of earnings, medication and treatment, travel costs to and from hospital appointments, and the cost of any care and assistance you have had. In terms of loss of earnings it may be necessary to instruct financial experts to assist for example an accountant (possibly a forensic accountant). We can assess exactly what evidence is needed and instruct the right people for the job. Who will pay for my personal injury claim? We are able to offer no win no fee for personal injury claims. Because we are recognised as one of the UK’s leading personal injury firms we will ensure that you receive the maximum compensation available and best of all every penny will go to you. Your financial circumstances change when you receive personal accident injury compensation. This means that your means tested benefits may be at risk. You can however protect your entitlement to your benefits, and benefit from your compensation too by setting up a personal injury trust. Our specialist personal injury solicitors will be happy to advise you if this applies. The legal costs associated with your personal accident injury claim include your solicitor’s fees, barrister’s fees, experts’ fees, court fees and fees charged for obtaining records for your case. When you win your personal injury claim it is usual for the Defendant to pay most if not all of your legal costs. However deciding how much the Defendant must pay can be a lengthy process. If we are unable to agree how much they must pay the court will decide. If the court has to decide the process can take in excess of 6 months. We have a specialist team who work independently of our personal injury solicitors to ensure the costs process is dealt with speedily and to your advantage, although there will be nothing for you to pay if your claim is funded by no win no fee. Investing your personal injury compensation requires thought and often specialist advice. We work closely with reputable and professional financial advisors who have extensive experience and knowledge of working with people with personal injury compensation awards. We can make a personal recommendation and a referral to an appropriate adviser on request. In many claims for personal injury compensation, your current medical situation, and what the future holds for you, may be improved by appropriate medical treatment, including surgery, physiotherapy, counselling or care being given at the earliest opportunity, rather than waiting until the claim has been settled. We have arrangements with providers of medical and other rehabilitation services to get you back on your feet as soon as possible. Please click here for more information about the additional services we can provide.